I love these photos sooo much! They actually made me cry with joy!! I cried too because I miss you Jennifer! I am so proud to know this girl!! Mostly for the fantastic person she is. Quirky and strong! Creatively phenomenal and a bit of a rebel. Jennifer is a London 2012 and Rio 2016 Olympian as a sport shooter. So do not mess with this chick! Jennifer is ALSO the most talented make up artist I have ever worked with. I know!! What else can she do well? We have collaborated on a couple of projects and hopefully there will be lots more. Jennifer knew exactly what she wanted her wedding dress to look like. Together we turned that vision into reality. Jennifer and Andrew married at Edinburgh castle on the 6th of December ( I loooove a Christmas wedding) Jennifer's dress was made with an ivory silk velvet bodice and silk chiffon skirt with a biscuit coloured silk underlay. My favourite part was the hand applied lace around the cuff and dropped waist of her dress. Hand sewing is my happy place when I day dream whilst painstakingly sewing appliques. We also applied the lace so that it looked as if it was falling of the one side of the dress!! Thank you for allowing me to walk this incredible journey with you Jennifer!! I adore you and adored making you your fabulous dress! Amazing shoes alert! For Shirley I designed a 1950's tea length silk dupion dress. I added a black velvet ribbon detail from Liberty London. If you have never been to the haberdashery department in Liberty London, GO ! It is heavenly. Shirley's bouquet was so gorgeous and colourful too. 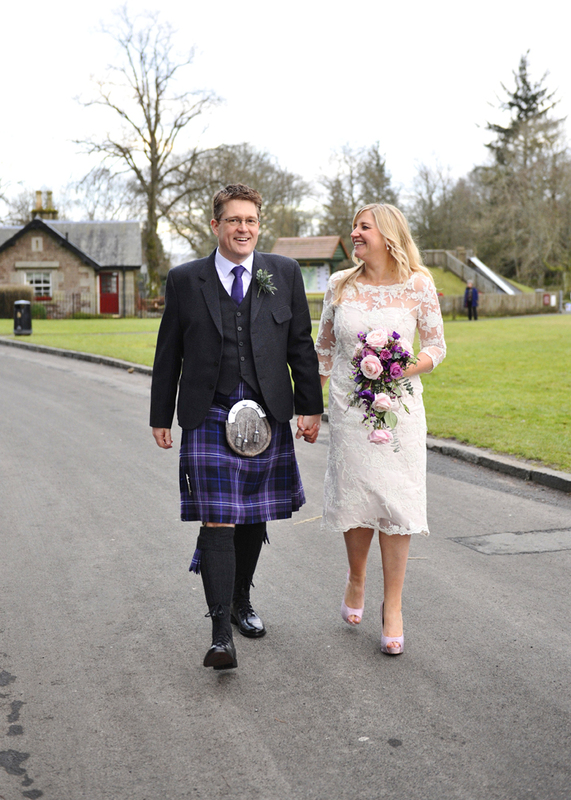 Linzi married her Greg in the Scottish Borders in November. Linzi knew she wanted a silver wedding dress. So together we sourced her fabrics and lace and designed her a dress that is just to her. Linzi's incredible granny came with her to every fitting and is one one of the most amazing ladies I have ever met!! Linzi, thank you for choosing me to make your dress!! I loved making this very special dress even though I still find black pearls and beads in between my floor boards :). Maxine and Stewart married on the beach in Thailand in the most beautiful setting! For Maxine we created a dreamy floaty dress that would be cool and complement their beach wedding. Together we chose the softest shade of pink for her dress so that the colour would not be too harsh in the bright sunlight and also because Maxine simply looks amazing in pink! For the bodice we used pale pink French lace and for the skirt pale pink silk chiffon. I loved every minute of working with these beautiful fabrics and this beautiful woman. Your just wonderful Maxine!! I have been lucky enough to work with the lovely Loraine twice already. Firstly to make her wedding dress and this time round making her a 50's styled silk dupion dress for a wedding. Loraine loves vintage styled clothes and wears it so beautifully. I love her vintage lace gloves and vintage 50's handbag. If you look closely at this dress you will most definitely spot a piece of my heart! I poured myself into Rhona's dress! I completely fell in love with this beautiful French lace and the super soft and lush silk crepe that we used for the underlay. Working with Rhona was also the most fantastic journey!! Watching her and her lovely mum interact with during every fitting inspired me as they are such wonderful friends. Rhona's dress had a silk crepe bias cut skirt underlay. We boned the top of Rhona's dress to give her support. The french lace bolero had a diamond cut back with button detail. I replied some roses and leaves around the neckline and sleeve hem to give a gorgeous organic finish to the bolero. Anne's initial idea for her wedding dress was completely different than what we designed for her :). I managed to happily convince Anne that we need to show of her amazing body and to also introduce a bit of color to compliment her beautiful sage green eyes. Anne's dress had a bias cut sage green silk crepe underlay and "sea pearl" french lace overlay. I complimented the dress with goupere lace trimmings around the neckline and the skirt seam. 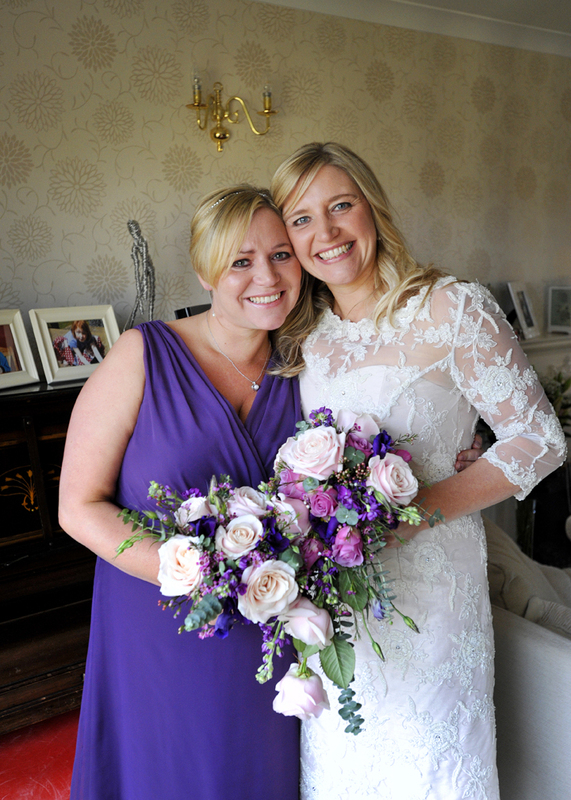 Anne married her Paul in a lovely intimate ceremony at there home. I took the images during fitting stages and Anne's sister took photographs on the day. Personally I completely love this dress!! If I had the figure for it (which I don't!) I would have loved to wear something similar on my wedding day. Instead I am hoping to make another gorgeous gown like this for more brides :). Come on people, make me happy! 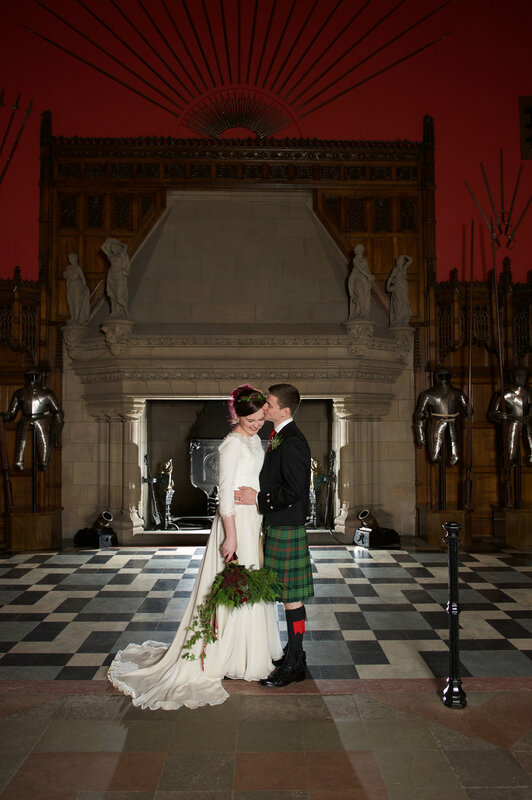 Lisa and Andy married at the incredible Eilean Donan Castle in the Scottish Highlands. When designing Lisa's dress we stayed true to Lisa's love of black, heavy metal music and tattoos. I designed her a dress to compliment the person she is. Lisa's dress had a blue silk dupion underlay with black lace overlay. When finishing the dress I reapplied the lace around the edges by hand to compliment her tattoos and to look like more tattoos onto her body. We added a black metal corset and bustle that I purchased ready made to enable me to stick to Lisa's budget. I met Becs 6 weeks before her wedding!! She was sure she was going to find the dress she would like for her wedding dress online. With 6 weeks to go she realized this was not going to happen. (Too my selfish delight as Becs was amazing to work with). Becs had a very strong idea of what she wanted her dress to look like. Together we finalized her ideas and then set out to source fabrics (quickly :). We made Becs a beautiful soft pink shift from silk dupion and then added a heavily beaded lace overlay to add sparkle to her winter wedding.